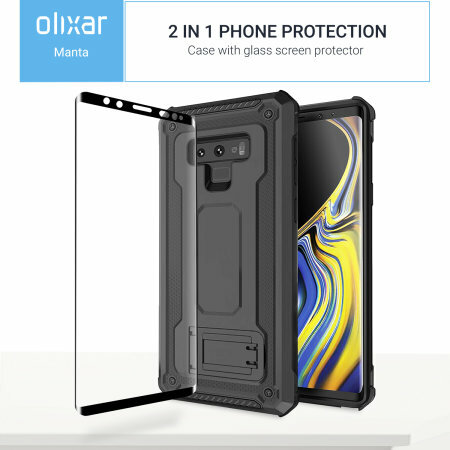 Equip your Galaxy Note 9 with a 360 degree protection with this new black Olixar Manta case & glass screen protector bundle. 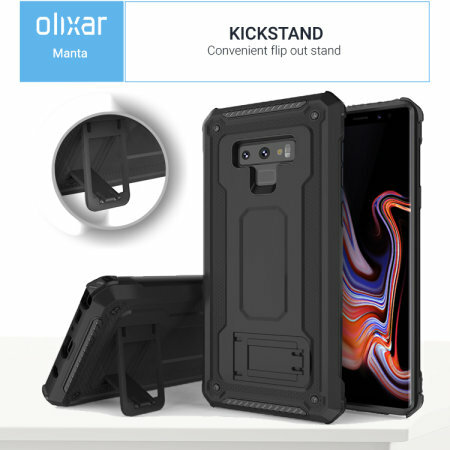 Enjoy a built-in kickstand designed for media viewing, whilst also compliments the case's futuristic & rugged military design. 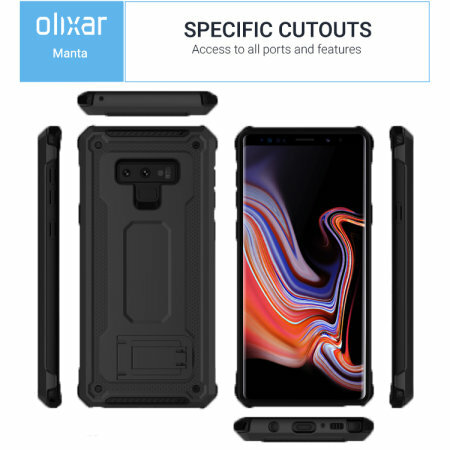 Featuring a robust military design, the Olixar Manta provides premium rugged protection for your Samsung Galaxy Note 9. 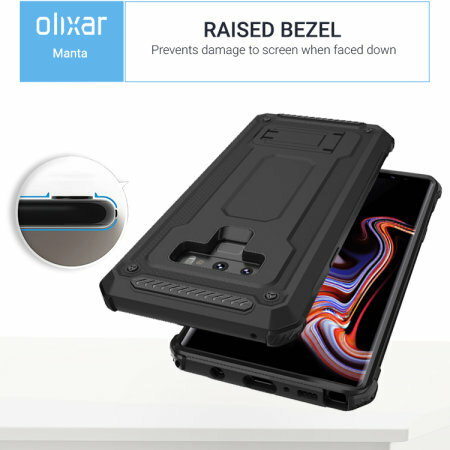 This hard-wearing tough case with a tempered glass cover included safe-guards your phone against whatever life can throw at it, keeping it in pristine condition at all times - even in the most extreme of conditions. 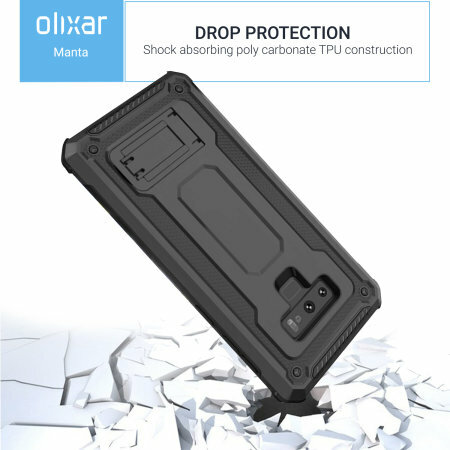 Whether you are having a serious business meeting, or having a back-garden party with your friends, the Olixar Manta will ensure that your device looks classy and well protected from all sides and angles. Composite layers of shock-absorbing thermopolyurethane and ultra-resistant reinforced polycarbonate take all the punishment your daily travel and use can throw at your phone, including drop protection. Reinforced corners are designed to deflect shock force away from your phone and the corners are the most vulnerable areas of any phone or case. Likewise, the phone's vulnerable buttons are catered for with generous and fully functional covers. Located at the back of the case is a super-convenient flip-out kickstand. Folding completely flat when not in use, the kickstand can be called upon at will, allowing you to effortlessly watch media at any time and in any place. You can now fully enjoy your Note 9's gorgeous display while on the go. The sleek military styling and ruggedised construction of the Manta case combines to create a case that perfectly compliments the Samsung Galaxy Note 9's stunning design. With it's dual material design, tough talking rugged aesthetics and eye-catching detailing with sharp lines, the Manta is very much a case for modern times and all situations. Along with the premium tough case Manta case mentioned, you will also be getting a complimentary full cover tempered glass screen protector. 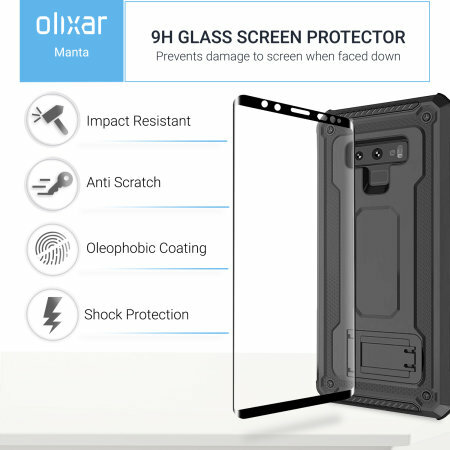 This screen cover is made from a high quality 9H tempered glass, which means a bubble-free installation and high-end protection for your Samsung Galaxy Note 9. 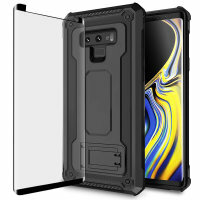 The tempered glass has been precision-cut for the Galaxy Note 9, meaning it will fit perfectly both on the screen and within the case. With full access to all of the Samsung Galaxy Note 9's ports and features (i.e. 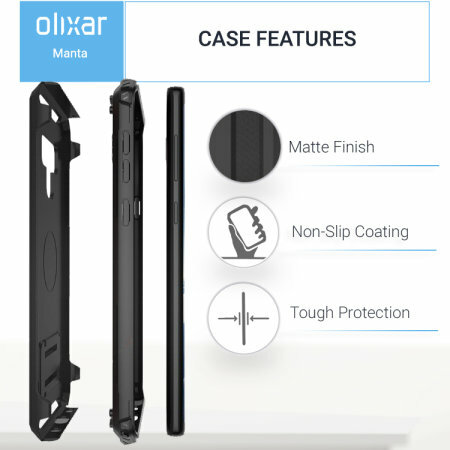 S-Pen), the Olixar Manta Case allows you to use your phone as you would normally, but with the added peace of mind that this highly protective & premium protection bundle.